Four years ago, police officer and former Navy SEAL Jack Haliday was undercover with a biker gang when his cover was blown. He got away, but so did the leader of the gang, Gunner. He's been waiting for Gunner to find him and exact his revenge ever since -- and he finally does. He rips Jack's family apart, and leaves Jack to pick up the pieces with his little girl, Lil. 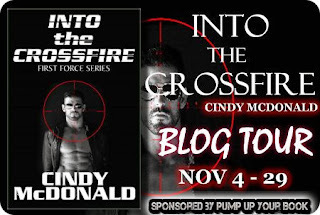 Into the Crossfire by Cindy McDonald is a great thriller with an engaging storyline and interesting characters. It was a quick read and kept my attention throughout. The story follows Jack and his daughter, as well as the First Force team that cares for them and works with Jack to take down Gunner and his gang. But we also get to see the gang, mostly from the perspective of Gunner's girlfriend, so we get to see both sides of the story to some extent. This gives us the opportunity to get to know many unique characters. I really enjoyed Into the Crossfire, particularly because of the characters. The storyline was complex enough to make it interesting, but also easy to follow. If you like thrillers that really focus on the characters, you should definitely check out Into the Crossfire. This is the first book in Cindy McDonald's new First Force series, and I will be looking forward to the next one. This review was written based on a copy of Into the Crossfire that I received from Pump Up Your Book in exchange for an honest review. Thank you for reading and reviewing INTO THE CROSSFIRE--I am so delighted that you enjoyed the story. Thank you for the lovely review! I agree wholeheartedly. Into the Crossfire is a rollercoaster of suspense and romance.